05.01.2003 - This job took place in an office. Rats had been jumping on desks at night, knocking things over, chewing on documents, pooping in fax machines, and things of that nature. I was called out to address the problem. The job started with a full inspection of the office building. Sure enough, it has several openings that rats could use to gain access inside. The roof vents did not have proper screens, and there were several gaps where pipes came out of the concrete wall but were not properly sealed around the edges. I saw the brown staining from rat fur indicative of repeated rat use in many of these areas, along with rat droppings. When I inspected the inside of the building, I saw the droppings and chewing inside the office space. I saw the most droppings inside the drop ceiling, where no cleaning or maintenance was done. The first thing I did was that I sealed all the openings that led into the building. I put new steel screens on the open vents, and I sealed all the open gaps shut with a special mix of steel and sealant. Next, I set traps all through the office and the drop ceiling. I returned three times to remove trapped rats, such as the one in the above photo. By the third visit, after a week with no new noise or evidence of rats, I saw that all of the traps were empty, and I knew that the problem was solved permanently. 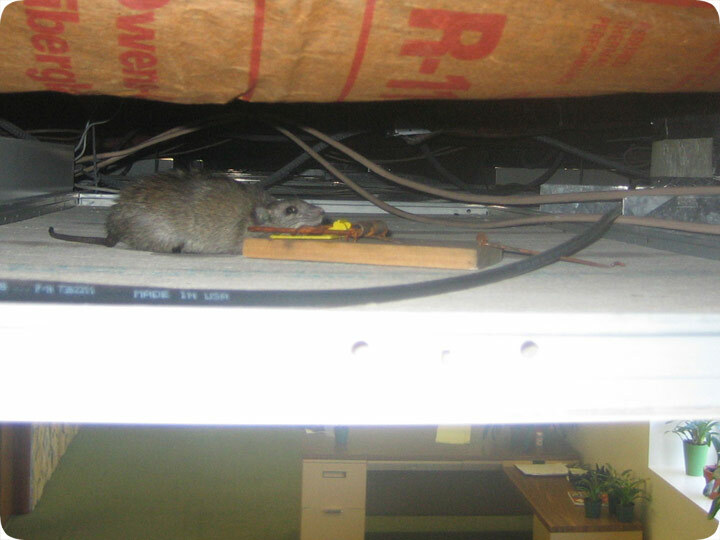 If you have a problem with rodents such as rats or mice in the ceiling, you need to follow similar steps, or call a professional such as myself to properly take care of the problem for you. Remember, never use poison for a mouse problem.